810 Colfax St. in Evanston, Ill., my home in the mid-1960s, when I studied at Northwestern University’s Medill School of Journalism. Chicago Jazz Festival at the Jay Pritzker Pavilion in Millennium Park. Georges Seurat’s “A Sunday Afternoon on the Island of La Grande Jatte,” at the Art Institute of Chicago. Recently refurbished monument erected by the city of Chicago to honor Irv Kupcinet, 1912-2003, famous columnist and television personality. The “Wendella” loading passingers for a cruise on the Chicago River. Chicago’s Buckingham Fountain in Grant Park. A view from an outdoor restaurant high above Michigan Avenue in Chicago. ChIcago’s Hyatt Hotel (darker buildings). The city of Chicago, photographed from the Northwestern University campus in Evanston. 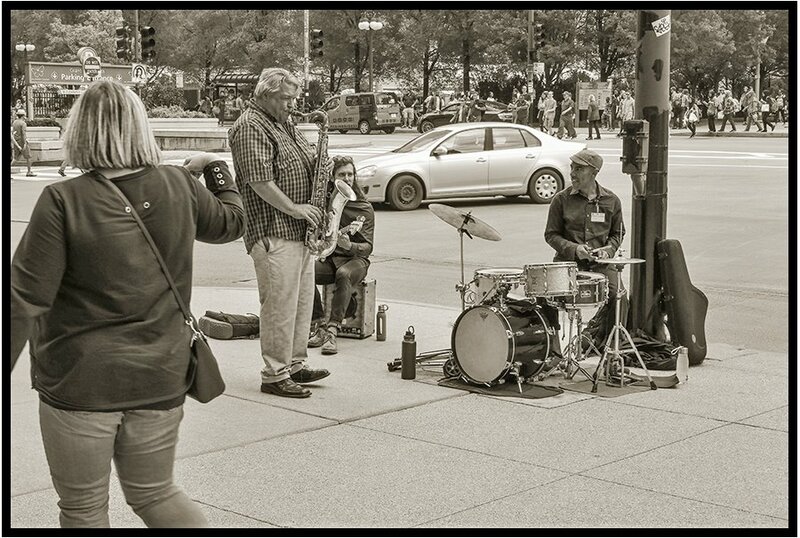 Bloomington, Minn., photographer Dave Vorland recently spent some time in Chicago, the Windy City. Dave went to graduate school in Chicago at the Northwestern University in the mid-1960s. Here are some of the sights that caught his eye.